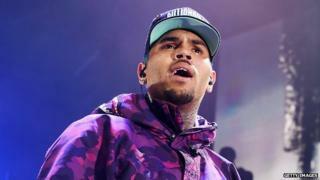 US Singer Chris Brown has been forced to cancel shows in Montreal and Toronto after Canadian officials stopped him from entering the country. Canada did not give a reason for denying entry to the singer. But authorities can declare someone "criminally inadmissible." Brown was sentenced to five years of probation for assaulting singer Rihanna before the Grammy Awards in 2009. Since then he has violated the terms of his probation on several occasions. In 2013, Brown was charged with a misdemeanour when he and his bodyguard got into a brawl outside a Washington DC hotel. Live Nation - the promoter of Brown's "Between The Sheets" tour - confirmed that the shows were cancelled "due to immigration issues". A spokeswoman for the singer, Nicole Perna, said Canadian immigration officials denied Brown entry but said that the musician can apply to return at a later date and plans to do so. Brown was also denied entry to the UK in 2010, forcing him to miss four shows. The British government said that the singer had been refused a visa because of his past criminal record.